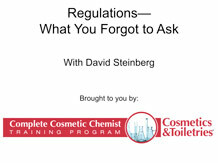 On Nov. 28, 2012, Cosmetics & Toiletries hosted a live webinar titled, “Regulations—What You Forgot to Ask,” featuring a call with industry regulatory expert David Steinberg. The webinar, moderated by Perry Romanowski, program director of the Cosmetics & Toiletries Complete Cosmetic Chemist Training Program, sponsor of the event, garnered more than 230 registrations and countless subsequent e-mail responses. Steinberg gave an informative and engaging presentation on worldwide regulatory concerns, which was followed by an interactive Question & Answer (Q&A) session, open to all webinar attendees. "The session went very well," said Rachel Grabenhofer, webinar host and editor of Cosmetics & Toiletries. "Audience engagement was great and resulted in a fantastic dialogue during the call, and even days later. It really shows that the industry is concerned about meeting regulatory requirements, and that there are still a lot of questions out there." Steinberg explained that the new deadline for OTC drug compliance is Dec.17, 2012. This means that companies cannot push products out the door that are not compliant. It is important to note that companies are now required to have Drug Facts labeling on sunscreens, which have new testing methods to follow and new labeling requirements. If sunscreen formulation was tested according to the old method, the tests must be conducted again following the new method, which involves critical wavelength. In addition, companies cannot use the claim “broad spectrum” on their product label until their formulation has passed this new test. It is also recommended to run the broad spectrum in vitro test first, which takes less time and is much less expensive. A preemptive in vitro test will allow for any necessary formulation adjustments to be made before conducting the human subject SPF testing, which takes much longer and is more costly. "The sunscreen portion of Steinberg's talk really perked up audience interest," said Grabenhofer. "Many of the follow-up questions related to the do's and don'ts of testing and labeling sunscreens." Steinberg called attention during his presentation to the US FDA's Drug Facts Label example on its website, which is incorrect in several ways. For example, it uses brackets where dotted lines should appear. Also, the way that inactive ingredients are listed is incorrect. When making cosmetic claims, the inactive ingredients should be listed by INCI name in order of predominance in the formulation. This is different from drugs, where inactive ingredients are listed in alphabetical order. In relation, Steinberg noted that registering OTC drugs is complex and suggested using the FDA's SPL electronic filing system. He strongly urged attendees not to do it themselves, as "it has a tendency to crash the user's computer." Companies must file with the FDA when adverse reactions occur. According to Steinberg, "If a company does not report an adverse reaction and is then sued, if they haven't reported the incident, this will weigh heavily against them in a court of law." California's Proposition 65 was also a topic of concern, as four new chemicals have been added to its list. Two of these which are not used in cosmetics but are found as trace contaminants are methanol and benzophenone—"not benzophenone-3," Steinberg noted. Benzophenone is a contaminant in the sunscreen octocrylene. When formulating with this octocrylene, it is important to ask suppliers what level of benzophenone is in their products. In June 2013, Steinberg explained that the European Union (EU) will replace the former Cosmetics Directive with the new Regulation. Steinberg pointed out that the benefit of this becoming an actual regulation means, "Now there is just one set of rules to follow." He also added that new provisions for nanotechnology-containing products will go into effect in January 2013, requiring companies to gain pre-approval 90 days before a product can be placed on the market. Products containing nanotechnology also will require special labeling; however, as of mid-November 2012, no companies had yet reported plans to promote nanotechnology in their products in Europe. The newest "headache" in Europe, according to Steinberg, relates to changes proposed in the Seventh Amendment related to fragrance allergens. Those of greatest concern are: hydroxyisohexyl 3-cyclohexene carboxaldehyde, which is not considered safe as low as 200 ppm and is a major component of fragrances; and chloroatranol and atranol, which are found in Evernia fururacea (tree moss) extract and Evernia prunastri (oak moss) extract and have been found unsafe. These materials are used in some of today's most popular perfumes, and their omission would certainly change some familiar and popular scents. For more information on regulations in the United States and Europe, visit the FDA and EU websites. The powerpoint slides from this presentation can also be downloaded.